Unlike other fertilizers, Roses Alive!™ works in perfect harmony with nature. As temperatures warm and moisture becomes plentiful, roses demand more nourishment to sustain their vigorous growth. That's just when the nutrients in Roses Alive! become more readily available! Unlike water-soluble synthetic fertilizers that force feed nutrients even when conditions are not ideal, Roses Alive! releases nutrients at a slow, constant rate, just as nature intended. We developed Roses Alive! specifically to meet the heavy feeding demands of roses--hybrid teas, floribundas, shrub roses, English beauties, heirlooms, and others. It's rich in phosphorus to encourage large blooms, healthy roots and disease resistance. 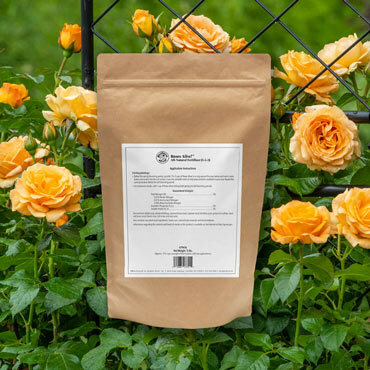 Apply 1.5 to 2 cups to each plant before their spring bloom and again before their late-summer bloom. For best results, scratch Roses Alive! into the soil and cover with mulch.